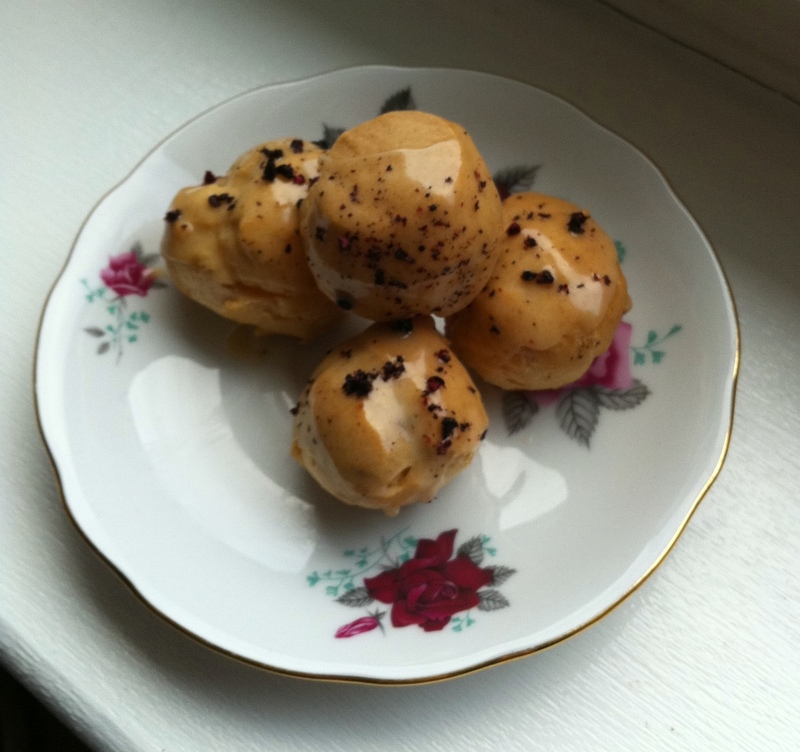 My December technical skills challenge was french macarons. I did sucessfully make macarons a year ago but having tried to make them again and met with major disaster I didnt think I could honestly say I had mastered the technique. 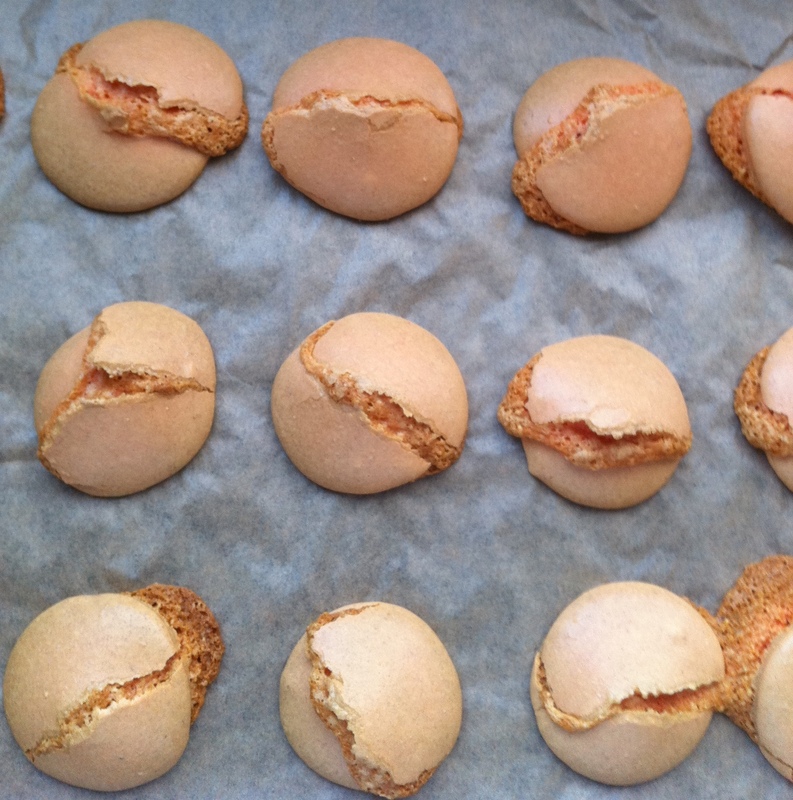 It turns out I needed another three messy attempts to get the hang of the macaronage, piping and my oven and I have a lot of tasty but hideous empty macaron shells in my freezer to use in a crumble or something else in which they can hide their unattractive faces. 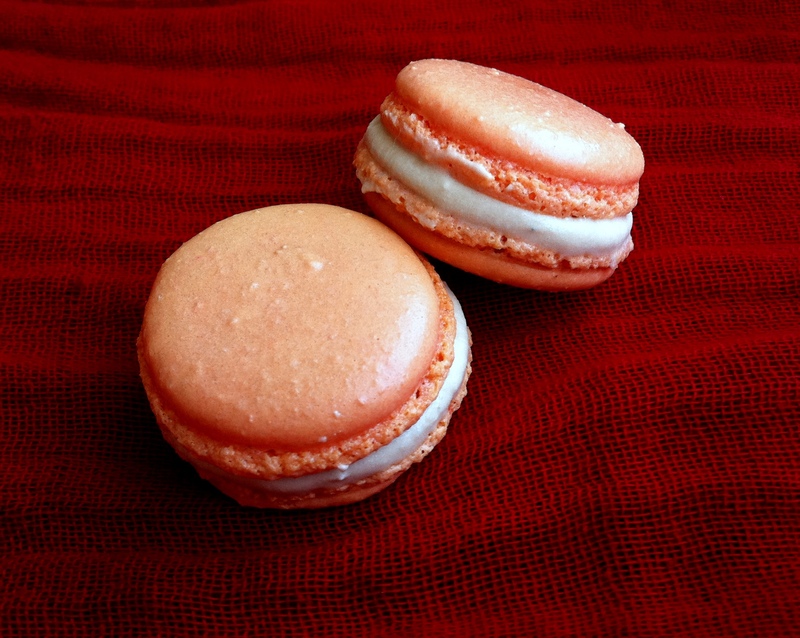 One batch were such a chewy castastrophe they didnt even make it into the freezer but finally I landed up with a socially acceptable batch of orange macarons, which I filled with a balsamic meringue filling. This was another attempt at creating some new extraordinary flavours and although I had an idea of the end result and could picture the two working well, the balsamic meringue turned out even better than I thought. It has a sweet burnt caramel flavour that isn’t vinegary at all and I’m dying to try it with strawberries and cream. I dont see any point in writing another guide to getting your macaron technique correct as there are already so many good ones out there but I will say that although they arent as scary as some will have you believe it does take a few attempts to get them just right and it is worth reading a few of the guides before you start. 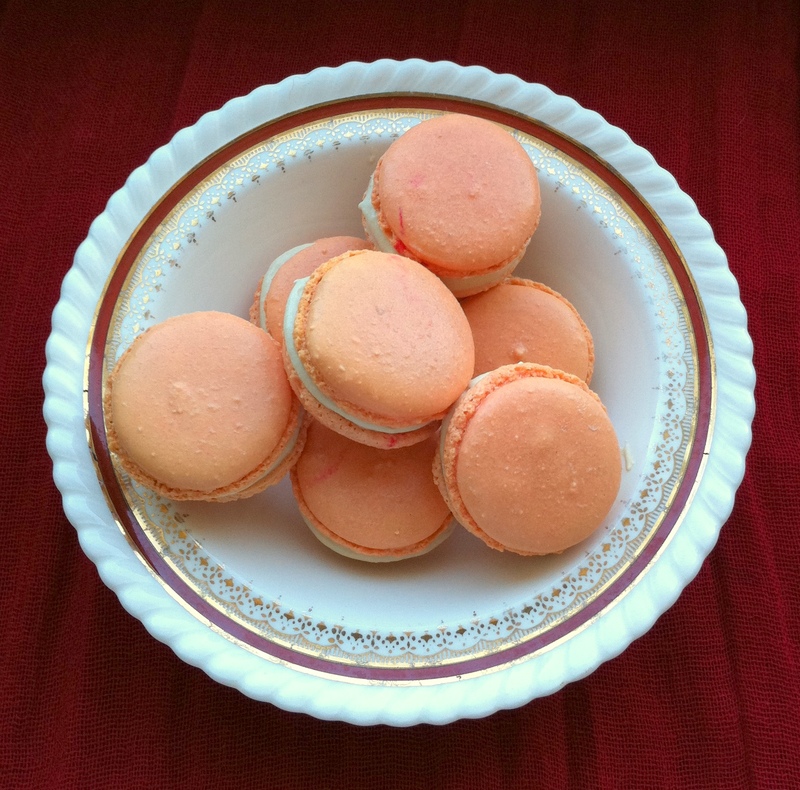 My recipe is adapted from the basic french macaron recipe in Les Petit Macarons by Kathryn Gordon and Anne E. McBride. Preheat the oven to 220 degrees C (200 fan) and line 2 baking sheets with baking parchment. Blend the almond flour and icing sugar in a blender, sift and repeat a few times until they are as finely ground as possible. Whisk the egg whites, sugar and cream of tartar/lemon juice together and then continue to whisk with an electric mixer until stiff peaks form (about 11 min). Fold the almond mixture into the meringue with a spatula until almost incorporated. Add the food colouring and orange essence and finish folding until the mixture is homogeneous and drops off the spatula in a lava like consistency. You dont want the batter to be too stiff or too runny so you have to be careful. Spoon the batter into a piping bag with a 1/2 inch tip and pipe round discs onto the baking sheets (using a circle temple under the baking paper makes this a lot easier). Slam the baking sheet on the worktop to remove air bubbles and leave to sit for 20-30 min which allows the shell to dry out. Place in the oven for 3 minutes and then turn the heat down to 160 (140 fan) and bake another 6 minutes. I found the initial increased heat along with the right batter consistency helped feet to form and stopped the shells being uneven or bursting. Put the vinegar in a saucepan and simmer until reduced by about half and syrupy. Add the golden syrup and bring to the boil. Continue to boil until the mixture reaches 115 degrees C.
Whisk the egg whites until they form soft peaks. Once the syrup is ready, slowly pour it into the eggs whites whilst whisking continuously. Keep whisking until stiff peaks form and the meringue has cooled (about 8 min). Add the salt and butter and whisk until smooth and fluffy. 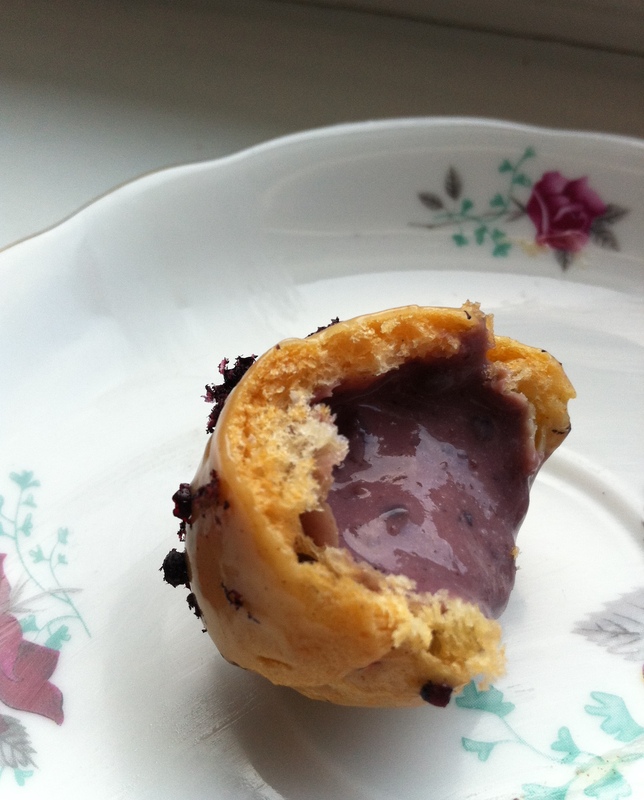 Place in a piping bag, pipe a small amount onto half the macaron shells and top with the other half. Store in the fridge for up to three days or freeze for up to three weeks. Friends are always asking me if I’m going to enter competitions like The Great British Bake Off or Masterchef and although I appreciate their somewhat misguided faith in my cooking abilities it immediately focuses my mind on all the glaring gaps in my repertoire, particularly essential techniques like pastry making that I am yet to attempt, without which I would get laughed straight out of a professional kitchen. It’s funny how people assume that when you start writing about food, you know what you are talking about. Anyone who has seen reality tv can tell that just because your creative output is displayed on a screen doesn’t necessarily mean you have any talent. However it’s that automatic faith that makes one feel as though one should be doing something deserving. So instead of continuing to guiltily brush off the kind suggestions of friends and family and walk around feeling like a culinary imposter, I am setting myself a challenge. And not being one to set myself a nice sensible target, it has turned into three challenges. Of course as soon as I write them down I will be forced to stick to my guns… which is partly the reason for involving witnesses… and partly to garner the moral support I think. The first challenge is technical. 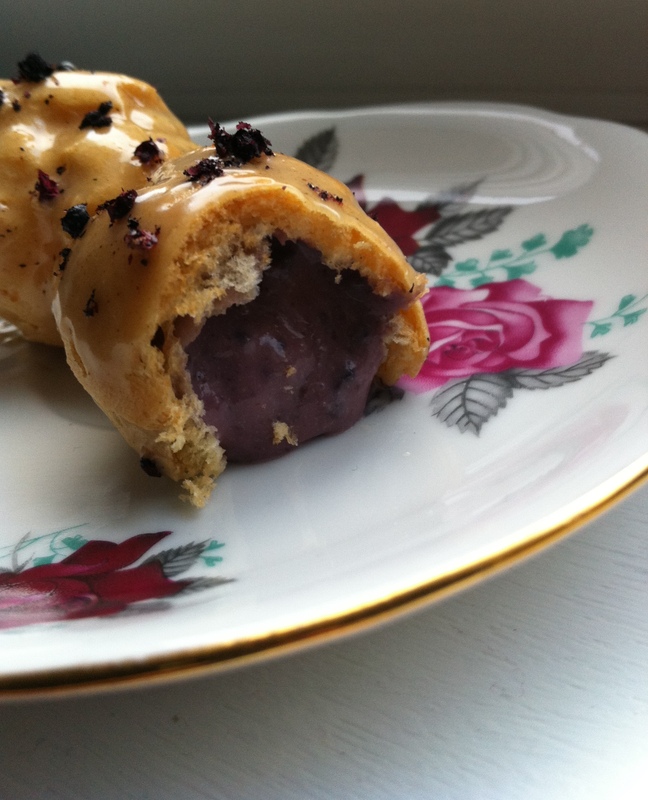 Each month I will learn a different technical skill that I’ve been too scared or too lazy to learn before now (think puff pastry – eek). The second challenge is to produce extraordinary flavours. I’ll try to create at least one dish with a suitably unusual flavouring or combination of flavours that I haven’t seen anyone else produce before. This one is about learning which flavours work without following somebody else’s instructions. My third and final challenge is reinventing a classic. This is probably the easiest of the three and probably overlaps with extraordinary flavours quite a lot but this is slightly different as it’s about picking one classic dish and creating my own recipes that remain faithful to the original idea but think outside the box a bit. I think that should keep me out of trouble for a while. I havent got around to creating a proper plan for what to make each month yet or deciding when my self-inflicted boot camp will come to an end but in the meantime I got so enthusiastic about the idea that I went and created two dishes that fit snugly into categories 2 and 3 to get me started, and to give you some idea of where I’m going with this. 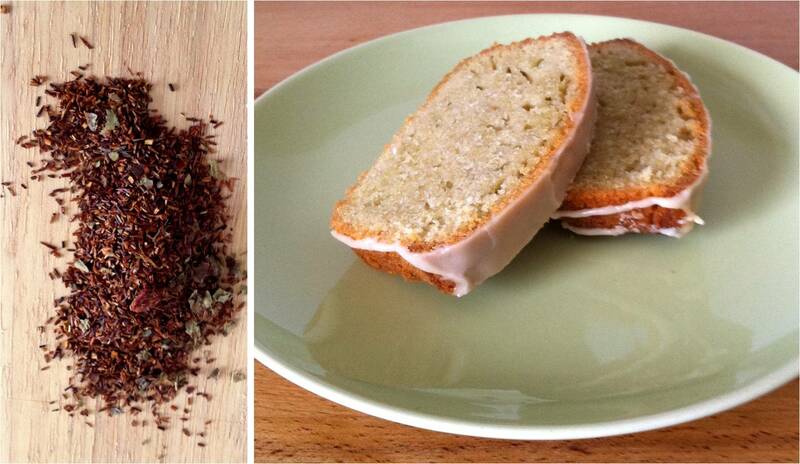 I guess I cheated a little bit as Whittard’s had already come up with the idea of pairing the Rooibos and Strawberry but I’d been thinking about a fruit and tea flavoured cake when I saw this tea and this option gets around the problem of finding fruit to bake with in winter. Even although strawberries are normally a summer ingredient the tea infusion turns them into something more autumnal and cosy. It sounds a little obvious now that I’m writing it down but nibbling a slice alongside a cup of hot tea brings out the flavour in both the tea and the cake and works almost like a good wine with the right cheese. Perfect bedfellows. Preheat the oven 170 degrees and butter and line a loaf tin. Cream the butter with an electric beater, add the sugar and continue to beat until pale and fluffy. slowly beat in the eggs one at a time. Sift the flour and fold into the butter mixture. Add 2 tbsp of the concentrated tea and mix until just combined. Pour into the loaf tin and bake for an hour or until golden and an inserted skewer comes out clean. Turn out onto a wire rack to cool. When the loaf is cool put the remaining 2 tbsp of tea into a bowl and add the icing sugar until you obtain the required consistency. 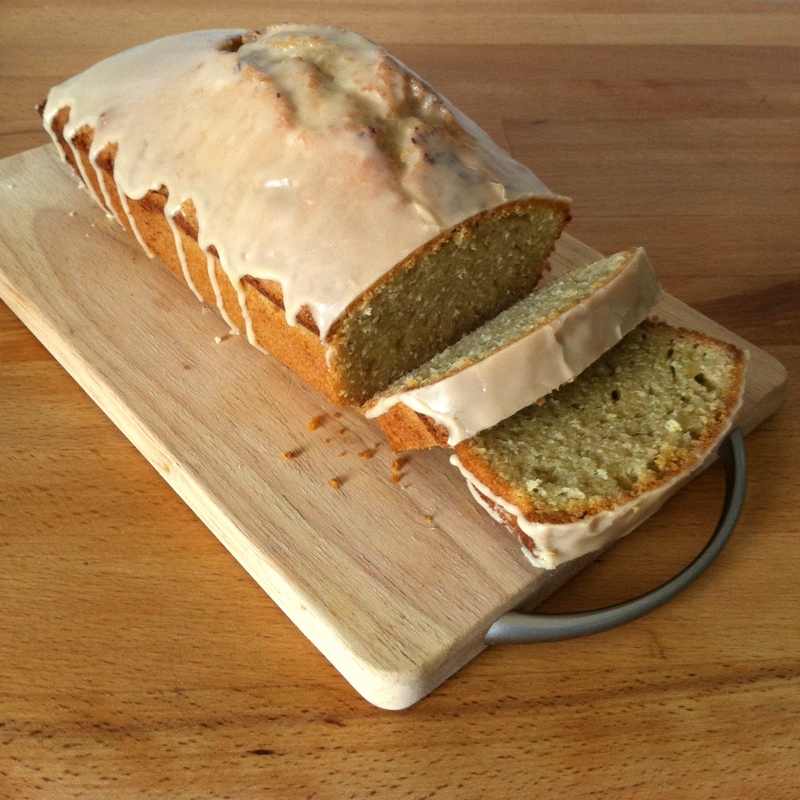 Drizzle over the cake. Most people have their own specific recipe for lasagne but it always uses the classic combination of beef and tomatoes. There’s nothing wrong with a classic lasagne and you might be thinking, if it aint broke… but I’m choosing it as the first subject of my reinvention challenge because other than vegetarian versions its not something everyone attempts to play around with very often. The star of this version is winter squash. It uses Butternut squash and Courgette as the main ingredients – yes I know Courgette isn’t strictly a squash but it belongs to the same squash/marrow family in my mind and it is gentle enough that it doesn’t overdo the number of loud ingredients. I also used turkey instead of beef as it plays a supporting role instead of taking over the show so to speak. Fry the onion in a little oil until soft, then add the turkey mince and continue to fry until it starts to brown. Add the chopped tomatoes and chicken stock and simmer until the liquid has reduced, about 20-3o min. Meanwhile either roast or gently fry the cubed butternut until soft. Preheat the oven to 180 degrees. To make the white sauce, melt the butter in a saucepan and stir in the flour. Cook over a medium heat for a few minutes and then whisk in the milk a little at a time. Keep stirring until the sauce starts to thicken and then add the grated cheese. 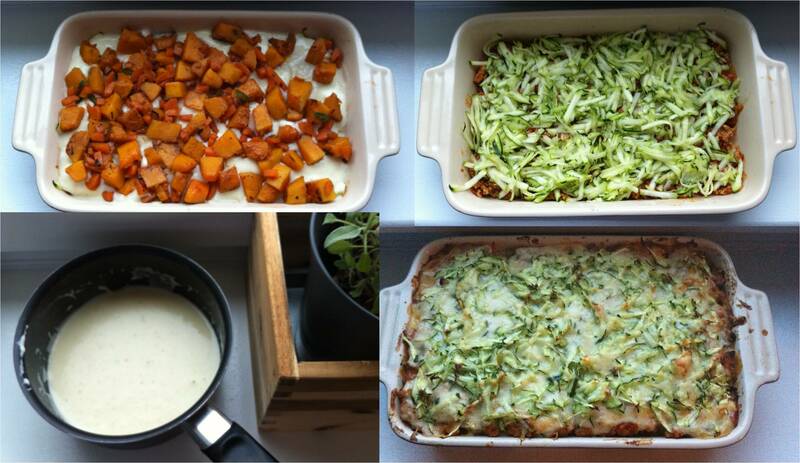 Starting with mince at the bottom, create layers of mince, grated courgette, lasagne, white sauce and butternut to fill a lasagne dish. It doesn’t really matter what order you create the layers in or how many you have of each but make sure the lasagne sheets have white sauce or meat on them otherwise they will be too dry. I like a layer of courgette on the top sprinkled with parmesan because it looks pretty and goes a little crispy in the heat of the oven. Once assembled place in the oven for 30-40 min until the top is starting to brown and the lasagne sheets are soft when tested with a knife. So that marks the start of my self-inflicted cooking school. 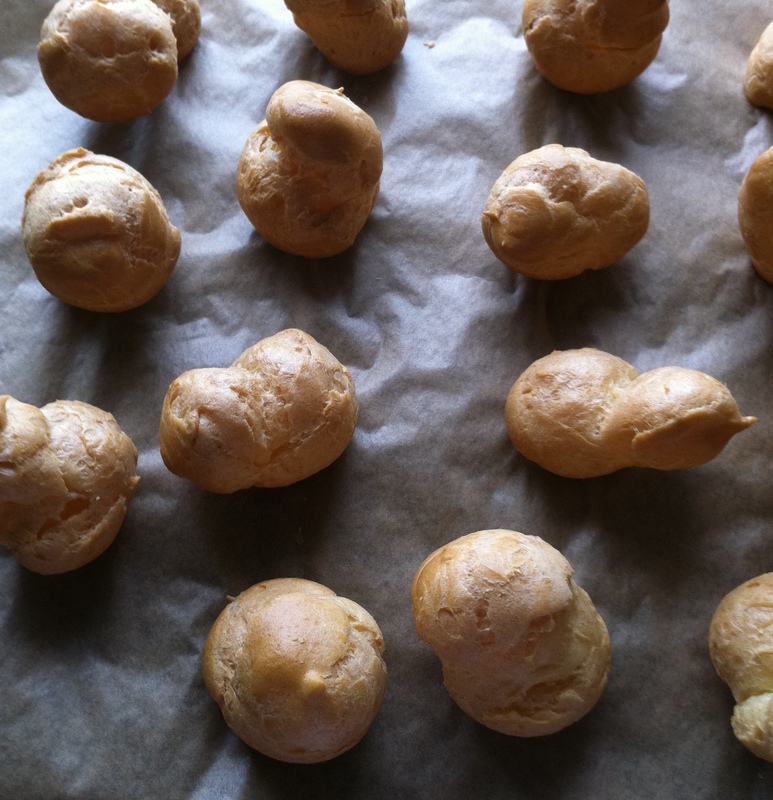 For November, I’m going to attempt choux pastry, come up with another lasagne recipe or two and think up some new flavour ideas which will hopefully merit a cursory glance. Should you feel the urge to go one step further and join me for one or all of the challenges, I would welcome the company and love to see what ideas you have so I’ll keep you posted on the next subject. If you choose to remain a spectator, I still welcome the company and hope you draw some inspiration from the recipes.